Take me out to the market! 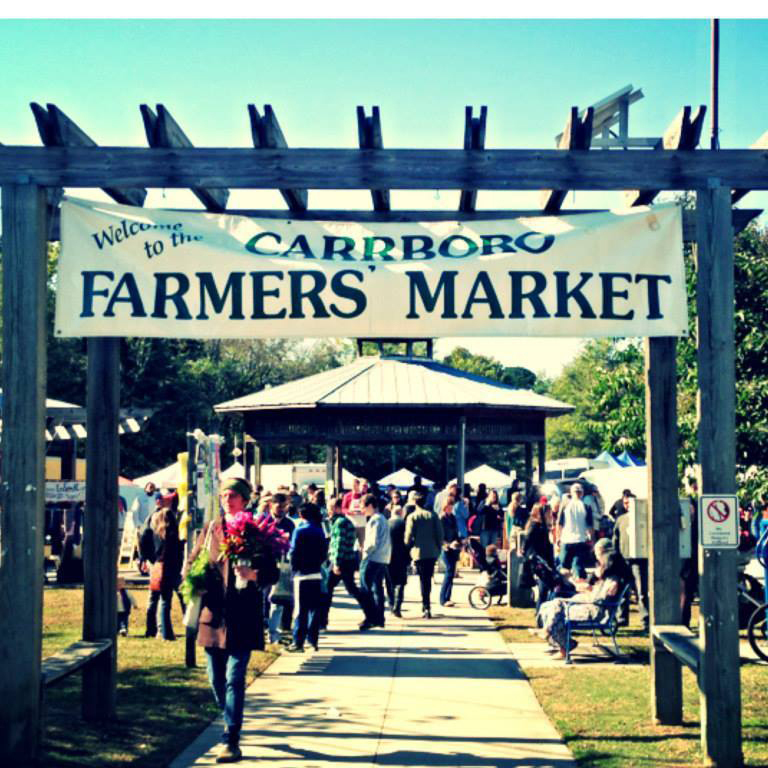 This week, we’re thrilled that Carrboro Farmers Market, our long-time member market and active partner, will be continuing our Guest Instagram series from North Carolina! Producers travel from within a 50 mile radius to set up shop on a former baseball field turned market place, boasting a roster of over 70 vendors, selling anything from berries to baskets. This year, CFM celebrates its 38th anniversary of providing wholesome, local food to its loyal fans. Market manager, Erin Jobe, pitched us the details behind the enduring success of her market. Farmers Market Coalition: What’s the story behind Carrboro Farmers Market? Erin Jobe: The Carrboro Farmers’ Market has been around since 1979! The Market is comprised of over 70 Market members who sell their locally produced goods each week directly to Market shoppers. All of the goods sold were produced within 50 miles of the Market, and the farmers and artisans themselves run the Market. In fact, the actual owner of each business or farm is present at Market each week. It is truly as local as it gets. The market is nationally recognized and home to many of the the most talented growers and artisans in the region. The Market has two employees that support the Market and its vendors. FMC: What does a typical market day at CFM look like? EJ: The Carrboro Farmers’ Market is located in downtown Carrboro. Vendors sell a wide selection of the highest quality locally grown produce, pasture raised meats, eggs, cheeses, breads, pastries, woodwork, metalwork, pottery, woven rugs, baskets, and much more. The Carrboro Farmers’ Market is open year round on Saturday mornings and seasonally on Wednesday afternoons. An average of 4,000 shoppers frequent the Market each week. Carrboro is a quirky small town that embraces its local food community. Loyal shoppers brave the heat, rain, and snow for their fresh produce, and the Wednesday Market is often buzzing with local chefs stocking up for the weekend. The Market is also located just a few miles from the University of Chapel Hill. FMC: What gets your community excited for market day? EJ: Throughout the year the Market hosts samplings, festivals, cooking classes, and other programming for the Market community. Our most cherished events include an annual tomato seedling giveaway for kids, the Strawberry Jamboree, Tomato Day, and the People’s Peppers. Tomato Day is always the craziest day of the year, where over 6,000 shoppers come out to sample from a selection of over 60 varieties of tomatoes! The whole town joins in the the action with a weeklong raffle at over 40 local businesses leading up to the event. In addition to large scale special events, the Market offers a series of youth programming including a POP club and a series of cooking classes for kids. Local chefs regularly come out to sample dishes for shoppers or become guest vendors for the day! The Market also accepts SNAP/EBT, and we offer a $10 match to SNAP/EBT shoppers, thanks to UNC Health Care and Carolina Farm Credit’s funding of healthy food incentives. FMC: How has social media worked to promote your market? EJ: Facebook tends to be a great platform for us, and the popularity of our Instagram account is also growing quickly. Our Market enewsletter has a 4,000 person following, so that is also another great resource for us. We also share that newsletter through a link on Faceobok. We have a Twitter following as well. We know that people LOVE pretty pictures of produce, so we try to make that a focus through all of our venues. FMC: What do you think our Instagram followers will love most about your take over? EJ: Our growers are always surprising me with the crazy things they can grow, things that even as a 5 year Market manager, I have never seen before (celtuce, baby artichokes in NC, water spinach, flower sprouts). We also have the sweetest and most diehard shoppers I have ever seen – looking forward to giving folks a snapshop of our Market community and the crazy things people will do in the name of local food. We had a huge state of emergency snowstorm the other week, and somehow a few vendors still made it to Market. We had a shopper cross country ski to Market pulling their kid in a sled….that’s a rare sight in North Carolina! Don’t miss out! Join the conversation and follow FMC on Instagram!